Canadian truck and logistics firms TFI International and Mullen Group Ltd. reported increased earnings for 2017, but TFI's results were mixed in the fourth quarter while Mullen set revenue records for its trucking/logistics segment. Montreal-based TFI reported net income of C$120.2 million, or $1.31 per share, compared with $45.3 million, or 48 cents, in the fourth quarter a year ago. The 2017 results benefited from a $76.1 million reduction in income taxes due to the enactment of changes in the U.S. tax law in December. Total revenue from continuing operations was $1.2 billion, a 4% rise from $1.1 billion a year ago. TFI received 57% of its revenue from Canada and 43% from the United States. The company operated 7,058 power units, 24,617 trailers and 9,074 independent contractors at year-end 2017. 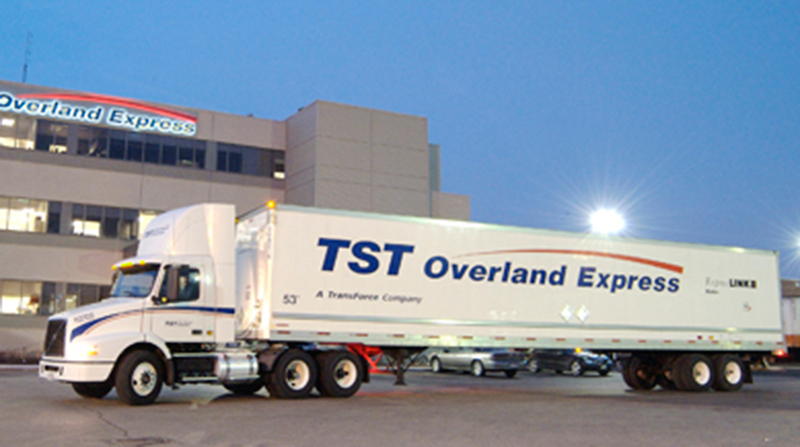 TFI’s major divisions include package and courier, less-than-truckload, truckload and logistics. In the quarter, the package and courier group saw operating income of $35.8 million, up from $32.3 million, on revenues of $317.3 million, down from $342 million. The LTL group reported income of $14.3 million, up from $13.3 million, on revenues of $194.8 million, up from $181.3 million. The TL group saw income of $22.7 million, down from $29 million, on revenues of $480 million, up from $461.4 million. The company attributed the decline in TL group income in part to customer right sizing and the driver shortage. The logistics unit reported income of $6.2 million, down from $7.9 million, on revenues of $79 million, up from $65.6 million. “The fourth quarter capped a year of continued strong progress on our key initiatives, including greater operational efficiency and continued robust cash flow,” CEO Alain Bedard said. For the full year, TFI reported net income of $158 million, or $1.70, up slightly from $157.1 million, or $1.64, in 2016. Total revenue from continuing operations came in at $4.7 billion, a rise of almost 18% from $4 billion in 2016. For the year, the package and courier group had income of $124.4 million, up from $113 million, on revenues of $1.3 billion, down slightly from 2016. The LTL group had income of $52.4 million, up from $47.9 million, on revenues of $799.2 million, up from $732.1 million. The TL unit saw income of $77.3 million, down 25% from, $102.5 million, on revenues of $1.9 billion, up from $1.5 billion. The logistics group reported income of $25.5 million, up from $21.8 million, on revenues of $299.5 million, up from $236.6 million. Also, Okotoks, Alberta-based Mullen Group reported fourth-quarter net income of C$5.4 million, or 5 cents, compared with a loss of $700,000, or minus-1 cent, in the fourth quarter of 2016. Total revenue was $296.1 million, up nearly 15% from $257.8 million. The company's major divisions are trucking logistics and oil field services. Mullen Group ranks No. 58 in the for-hire TT100. Trucking logistics revenue rose $33.6 million in the quarter to $206.6 million, while oil field services saw revenue of $89.4 million, up from $84.4 million. Mullen didn’t break out income for individual divisions. The revenue rise in trucking/logistics was attributed to a stronger economy in Canada and Alberta. For full-year 2017, Mullen reported net income of $65.5 million, or 63 cents, up 26% from $52 million, 52 cents, in 2016. Revenue totaled $1.1 billion, up 10% from $1 billion. Trucking logistics for the year had revenue of $761.4 million, up 10.4%, due to acquisitions, growth in the LTL business as the economy did better and gains in market share. The oil field services unit saw growth of 8% primarily due to improved drilling activity. Mullen also reported recently it had acquired DWS Logistics, a third-party logistics provider of value-added warehousing and distribution services. Terms were not released. DWS is based in Mississauga, Ontario, and operates distribution centers with more than 500,000 square feet of warehousing space, primarily serving the consumer products sector. DWS has four distribution centers in Mississauga and two in British Columbia. Mullen said it would operate DWS as a stand-alone business unit with Greg Miller as president. Miller formerly owned DWS. The unit could add more than C$15 million in revenue annually to Mullen’s bottom line, according to Mullen.